I'm going out in Soho tonight so I will be taking my trusty Mulberry Daria clutch with me. During the day my work bag is rather large and I like to fill it out with all sorts of rubbish. In the evening however I try to be a bit more limited in what I bring with me and of course my bag is always smaller. So I generally like to pack what I call (and I'm sure what most of you call) 'the essentials' which is my purse, my iPhone, my door keys and my Oyster card. I didn't bring my purse tonight as when folded out this bag as a zipped compartment where I like to keep my money and cards. Then for the added extras which tonight will consist of my Maybelline lipstick in taupe along with my Chanel lipgloss in amour for added glossiness. I'm forever touching up my lipstick during the night so I can't leave home without it. Then I have a hairband and some kirby grips in case I get really hot and need to tie the mane back. I like to go to raves a lot which tend to get really sweaty and with my long extensions now having a hairband with me is a must. Although there won't be any raving tonight! I also have my little Chanel compact mirror in there so I can see where I'm applying my lippie, especially after a few drinks! And to check the barnet isn't flying everywhere. Lastly I sometimes like to pack gum or mints because you never know who you might meet haha ;) However, some clubs are funny about you bringing stuff like this in so depends where I'm off to. 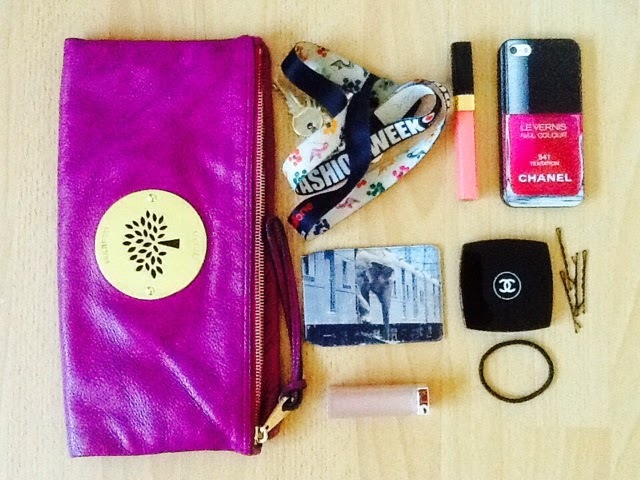 My clutch bag is small, compact and has everything I need in one place. Perfect. Instagram | Twitter | YouTube - check out my drugstore haul here.